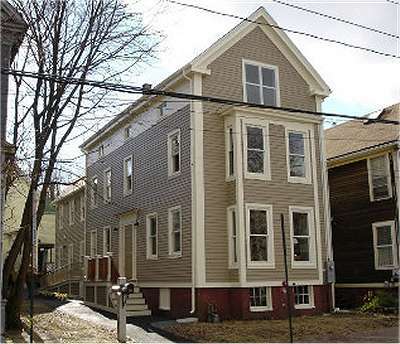 One of the joys of living in New England has been the look of the houses. They are so different from what I am used to, the brick and pebble dashing that defines the houses in Britain. Here, every house is different from its neighbor too, an assertion of that American spirit of independence and freedom. As in much of the States, wood is most often the chosen building material for houses in New England. Perhaps more than anything else, the timber houses ensure that this area can never be mistaken for Olde England. Even in Shakespeare's time, wood was scarce and expensive enough in England for it to be used only for the frame of a house, the gaps being filled in with wattle and daub, stones or whatever else was available in the area. But in the States, the forests still cover vast areas and it makes sense that wood should remain an important mainstay of the building industry. Nowhere is this more so than in New England where the trees may even be winning the ancient battle with humankind. These colonial style homes are so typical of the area that they become commonplace and it is easy to miss how distinctive and pleasing they are. Houses in the old style known as Saltbox are perhaps the prettiest of all. Narrow and yet long, their proportions speak of another time when life was simpler and made fewer demands on living space. Frequently they have been added to over the years as their occupants found the need for TV rooms, laundry rooms and garages, but the larger ones have stayed just as they were originally. 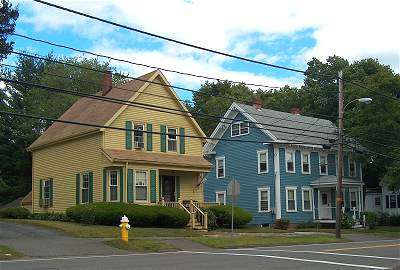 The New Englander still believes in color too, and these timber houses can be almost any shade except ugly. Perhaps because the frames and details are always picked out in white, houses can be painted in red, green, blue, yellow or gray and it always works. In television home-decorating programs in Britain, a style termed "New England" is often mentioned and this invariably means pastel and faded colors that give a weathered appearance to surfaces. Yet the reality is much brighter and daring. All this color fits perfectly with the landscape, blending with the trees that still dominate, even in the towns. New houses are built in the same way as the old so that it becomes impossible to guess the age of a house, unless it has exceeded the magic one hundred years and earned a plaque announcing its birthdate. And the result is a timeless feel to the area, a certainty that, no matter what goes on in the wider world, this land will always be New England. Hi Clive- Nice pictures. I lived in New England last fall and it was beautiful. I was also surprised when people warned me that everyone up there was going to be stuffy. I found quite the opposite- many were friendly to strangers. It is still New England and it is still America! Thanks, Rick - and I agree that New Englanders are a good deal more friendly that their reputation. They are quiet, rather like my own countrymen, but have good hearts. !